Inconsistent flow: an initial stream of abrasive flows, but quickly tapers off. Clumping in the abrasive tank: clumps and clogs completely restrict abrasive flow out of the nozzle. No matter the weather or how the air feels, atmospheric air always contains moisture (humidity). Humidity happens. Humidity is a problem for most MicroBlasting systems, even in arid regions, because of the nature of the compression process inside the blaster. Atmospheric air compressed to 100 psi is one-eighth its original volume yet still contains the same amount of moisture. The air heats up as it is compressed, then cools as it leaves the compressor and travels throughout the system. Any significant drop in temperature or increase in pressure causes moisture to condense out of the air. The compression process causes both of these changes to occur; therefore, moisture condensation in your blaster is inevitable. Even if your compressor has a separator filter, a trap or a dryer attached; you still need additional protection. These items cannot remove enough moisture from the airlines on their own to protect your blaster. Bowls, traps, or “drop legs” in the airline usually fail to allow all of the condensation in compressed air to flow out of the main lines. They may capture a lot of large water droplets, but these features do nothing to prevent water vapor from passing through to your blaster. How Do You Prevent Moisture Contamination? Always make sure containers (bags or bottles) remain tightly closed when not in use. Store powder in a cool, dry location avoiding wide variations in temperature to prevent the abrasive media from absorbing moisture from its surrounding environment. The tank is NOT a sealed container, even with the machine off and depressurized. Leaving powder in the tank for a day or two can cause the powder to absorb enough moisture from the shop air to clump. Dirty air from your air compressor is the single greatest source of problems—not only with abrasive but with your Comco blaster. You MUST have an adequate compressed air treatment system installed to prevent contaminants including oil, water and other particulate matter, such as pipe scale, from reaching your machine. It is essential that you inspect and maintain your air compressor, air dryer, filters, traps and lines on a regular basis. Carefully follow all of the manufacturer’s instructions. Separators, which remove liquid by forcing the air stream to spin or change direction, efficiently remove liquid droplets but not sub-micronic oil aerosols and water vapor. Coalescing filters capture liquid droplets in a bed of fibers. The captured droplets move along the fibers, coalescing into larger droplets which drain to the bottom of the cartridge for removal. These fibers are adequate for providing virtually oil-free air, but they are no more effective on water vapor than separators. Refrigerant dryers are found on most air compressors. This type of dryer is insufficient for MicroBlasting. Most common refrigerant dryers yield a compressed air dew point of +35˚ F. This is still six times more than the amount of water vapor required for trouble-free operation in your blasting system. Most air dryer manufactures rate their equipment for dryness on “dew point.” Dew point is a figure derived from a complex formula based on relative humidity, temperature, air pressure and flow rates. Simply stated, dew point describes how cold the air supply can get before water condensation begins to form. The greater the volume of moisture in the compressed air line, the higher dew point. Some types of abrasive media may be more or less susceptible to moisture than others, but the microblasting process requires that the water/air ratio be below 200 parts per million (PPM). This corresponds to a dew point of -25 degrees F.
There is no need to replace your refrigerant dryer unless you need absolutely dry air throughout your entire facility. The solution to most micro-abrasive blasting operations is a point-of-use air dryer next to your blasting unit. This is a much more cost-effective solution since the air dryer needs only to be sized according to the machine needs, rather than an entire facility. Several types of compressed air treatment systems are available which may be used instead of, or in conjunction with, a refrigerant dryer, including membrane and desiccant air dryers. Use a super-absorbent bead that literally “pulls” moisture out of the compressed air as it passes through the dryer. When the beads are fresh they can achieve dew points < -35˚ F. The beads have a limit to the amount of moisture that they can absorb. Most manufacturers will use a bead that changes color when the bead becomes more saturated, typically blue to clear. When the beads become clear they will need to be either regenerated or replaced in steady use. This may be required as often as once per week. To regenerate the beads, the moisture must be driven off with heat. Each recharge causes the beads to lose some of their water holding capacity. This significant amount of maintenance normally limits the use of a desiccant dryer to intermittent applications where the amount only a minimal amount of air requires drying and a low cost is critical. Use towers containing the same type of desiccant bead as a standard desiccant dryer but are able to recharge the desiccant during operation. There are two styles of regenerative dryers: heated and heatless. The heated dryers use heat to drive off moisture from the saturated beads. Air in a heatless dryer alternates between two towers containing zeolite; one tower removes moisture from the air line while the other tower regenerates it. Typically they will switch every 30 seconds to one minute. This “bootstrap” operation can achieve a dew point as low as -75˚ F on a continuous basis. Use a semipermeable hollow membrane of fibers in which water vapor will diffuse through the fiber walls (osmosis). The moisture is removed from the unit through an automatic air purge. Membrane dryers can achieve dew points as low as -40˚ F.
This air purge continuously removes the excess water vapor from the system, eliminating the maintenance requirement associated with desiccant dryers. The initial cost for a membrane dryer is usually higher, but for heavy-use environments, the upfront cost is offset by the reduced need for maintenance. Comco offers two styles of air dryers for point-of-use operation. Choosing the correct air dryer for your application is easy. If you use your Comco blaster intermittently during the day, the AD5100 Series Desiccant Air Dryer (single tower) should suffice. If your operation requires continuous use of your machines in a production environment, then you will need the AD5300 Series Continuous Duty Membrane Dryer. Contact your Sales Representative or call Comco at 1-800-796-6626 for more details. MicroBlaster specifications require that oil in the air source be no more than 10 PPM. Since oil molecules are relatively large, this is easily and inexpensively accomplished with a simple in-line coalescing filter. Additionally, the oil will bond with the agents used to dry the compressed air, limiting their effectiveness. As the dryer becomes coated with oil it will not absorb moisture, allowing it to pass through to the MicroBlaster. Make sure the oil filter is installed upstream from the air dryer. Oil contamination is a common problem caused by air compressors, especially older piston (reciprocating) compressors. As air compressors age, seals begin to fail and oil escapes into the air lines. Newer style rotary screw (vane) compressors and “oil-free” reciprocating compressors are not subject to this problem. There is one final, and very important, point you need to be aware of when it comes to air treatment systems. They must be well-maintained to ensure proper operation and protection of your micro-abrasive blasting equipment. Water filter elements need to be replaced on a regular basis (about once a year), and the desiccant dryers need to be recharged when the desiccant becomes saturated. In extreme cases, this may be as often as once per week. 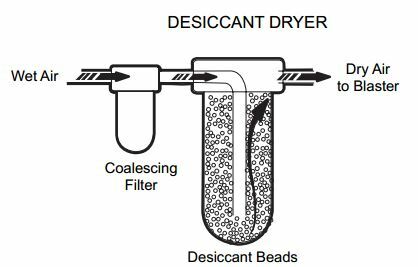 Saturated desiccant beads will not absorb water vapor from the air, allowing moisture-laden air to reach the blaster. Review the literature provided with your dryer to become familiar with its maintenance requirements. A clean air supply will go a long way in ensuring you enjoy many years of trouble-free operation from your MicroBlaster. The cost of using wet air far exceeds the cost of purchasing a dryer. With the proper compressed air treatment equipment, system pressure is maintained, operation expenses are reduced, and production quality is improved.